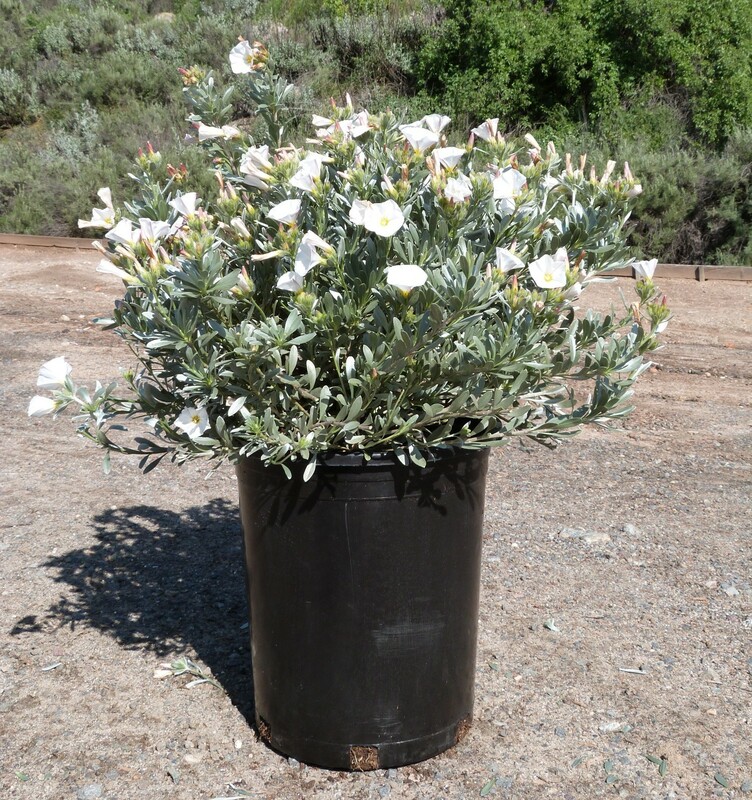 Convolvulus cneorum or Bush morning glory is a small yet fast-growing blooming shrub. When in bloom plants make quite a bold statement in the landscape. Bush morning glory gets its name from the profusion of white funnel-fused flowers the plants produce. Flowers are approximately 1.5-2” in diameter and resemble classic morning glory flowers. The evergreen silver lance-shaped foliage reaches about one inch in length. During the growing season this attractive little shrub will be completely covered with flowers that bees adore. It’s the perfect addition to xeriscape and Mediterranean gardens with water-wise maintenance. Bush morning glory is also suitable for containers since it stays relatively small at only 2-4’ tall and wide. Grow plants in full sun for best results, as planting in too much shade can cause plant to become leggy and bloomless. Bush morning glory needs excellent soil drainage, so it is imperative to improve soil texture at planting time. Excess moisture, especially during winter, won’t be tolerated. Plant this shrub slightly above soil grade to avoid crown rot. Plants can be pruned back hard in late-winter to refresh them for spring.